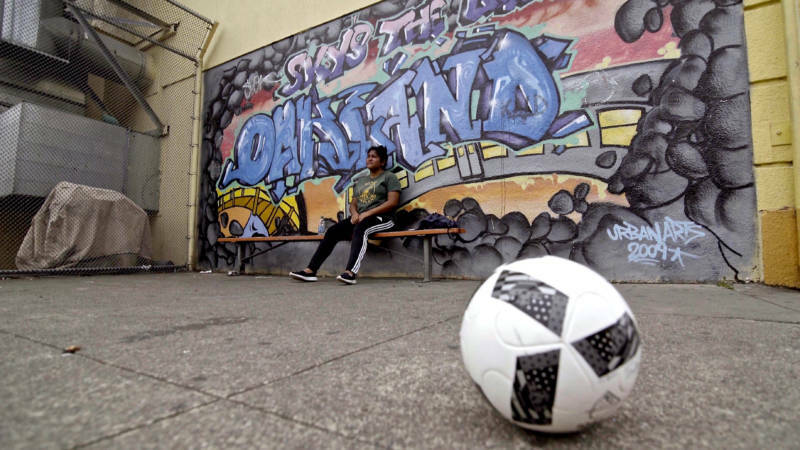 Futbolistsas 4 Life takes you into the lives of two Oakland high schoolers: One is a college hopeful and DACA applicant who’s navigating the reality of his immigration status, and the other is an American citizen who lives in fear that her undocumented parents may be deported. These youth take solace in the game of soccer, which lets them if only for a moment, put their worries on the sidelines. Futbolistas 4 Life sheds light on the overwhelming stress experienced nationwide by immigrant youth living in communities with high rates of poverty and violence – communities increasingly in the crosshairs of harsh federal immigration policies. The film captivates viewers with its compelling characters, cinematic footage, carefully crafted animations and beautiful score by Grammy Award-winning Adrian Quesada. Jun Stinson is an Oakland-based filmmaker and a producer at AJ+ . She has worked as a post-production producer and editor withAl Jazeera America and produced stories for CurrentTV and KQED, among others. She was also on the post-production team of the feature documentary Spark: A Burning Man Story that premiered at SXSW. Her work is published in the Washington Post, Associated Press, ESPNW, and SFGate.com . She is a former BAVC National MediaMaker Fellow and San Francisco Film Society FilmHouse resident . Jun was raised in both Oakland and Kobe, Japan, and is a graduate of UC Berkeley’s Graduate School of Journalism.